TOKYO - Taro Aso has never been one to hold his tongue. But Japan's 72 year-old deputy prime minister may have outdone himself with his latest gaffe. At a government panel to discuss social security reforms, the former prime minister called the elderly who are unable to feed themselves "tube people," then proceeded to say the elderly should be allowed to "hurry up and die" to reduce the burden on a country tasked to pay for their medical expenses. Adding his personal experience, Aso said he had already written a will, directing his family to let him "hurry up and die," refusing end-of-life care. "Even if (doctors) said they could keep me alive, it would be unbearable," he said. "I would feel guilty, knowing that (treatment) was being paid for by the government." Aso later argued that his comments were misinterpreted. He was speaking about his personal wishes, not those of all senior citizens. The issue of elderly care remains a major challenge for Japan, the world's fastest aging country. Nearly a quarter of the population is 65 and older, with that number expected to spike to 40 percent in the next 50 years. Concerns about financial strains placed on social security and pension systems are so grave, lawmakers passed an unpopular tax hike bill last summer, agreeing to double the sales tax to 10 percent over the next three years. Aso has a history of verbal blunders. He once compared an opposition party to the Nazis, and said he wanted Japan to become the kind of country "the richest Jews would want to live." 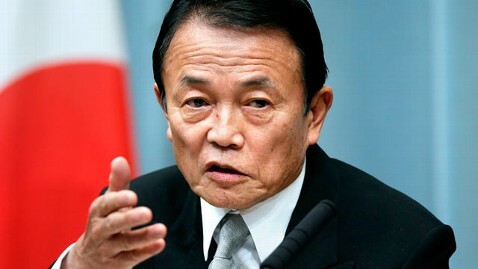 In 2008, while still prime minister, Aso called the elderly a "feeble" group. "Why should I have to pay taxes for people who just sit around and do nothing but eat and drink?" he said at the time. He later apologized for his comments on national TV.